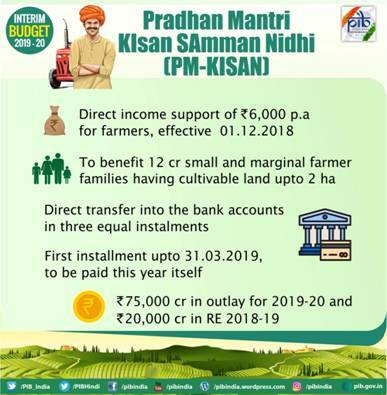 Government is launching a historic programme namely “Pradhan Mantri Kisan Samman Nidhi (PM-KISAN)”. Under this programme, vulnerable landholding farmer families, having cultivable land upto 2 hectares, will be provided direct income support at the rate of Rs 6,000 per year. This income support will be transferred directly into the bank accounts of beneficiary farmers, in three equal installments of Rs 2,000 each. 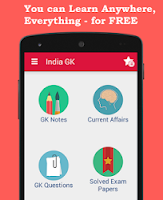 This programme will be funded by Government of India. Around 12 crore small and marginal farmer families are expected to benefit from this. The programme would be made effective from 1st December 2018 and the first installment for the period upto 31st March 2019 would be paid during this year itself. This programme will entail an annual expenditure of Rs 75,000 crore. The Budgetary allocation of the Agriculture and Farmers’ Welfare Ministry has been raised by around 2.5 times from Rs 58,358 crore in 2018-19 to Rs 1,41,174.37 crore in 2019-20. Comparing five year period, during UPA government (2009-14), it was Rs 1,21,082 crore and during Modi government (2014-19), it is an increase of 74.5% to Rs 2,11,694 crore. In fact, the budgetary allocation of Rs 1,41,174.37 crore in 2019-20 is 16.6% more than Rs 1,21,082 crore during UPA (2009-14).